It is with great sadness that we have learned of the death, after a long illness, of Sandro Saggioro. We knew him personally having met on several occasions, including during the research which led to his history of the Communist Left of Italy, and we had appreciated the human side, as well as the scientific rigour and scrupulous care which he put in his studies. Though not of our current, drew on more in a kind of “heterodox Bordigism", if you like, but we recognise him as a comrade who, despite a different framework, was fighting the same battle as we are for a different and better world. To his loved ones, and the people closest to him we send our condolences. English readers may not have heard of Sandro Saggioro but he is well known for his research over the years into the history of the Communist Left. 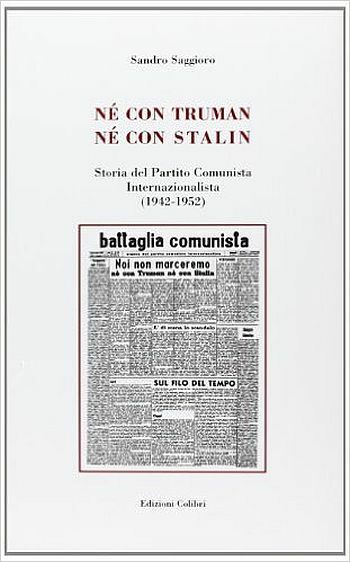 His final work “Neither Truman, Nor Stalin”, a history of the Internationalist Communist Party from 1943-52, is very informative even if he took the side of Bordiga over the split that the latter brought about it 1951. Hopefully one day it will be translated into English.